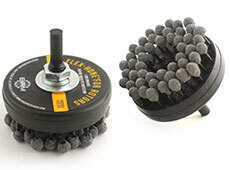 The Flex-Hone® tool from Brush Research has set the industry standard for excellence in honing tools. Our flex hones for rotors are specially designed to provide the ideal surface finish for disc brake rotors and flywheels. With the ability to finish more rotors per hone, we know our honing-tools will be the answer your to rotor finishing needs. To learn more about our flex hones, download the PDF of our Flex-Hone for Rotors brochure. Need Help Selecting A Flex-Hone® for Rotors? When to Choose Fine Grit? Choose Fine Grit Flex-Hone® for Rotors (240) for light duty vehicles and when appearance is important like motorcycles and exposed rotors. When to Choose Medium Grit? Choose Medium Grit Flex-Hone® for Rotors (120) for most standard duty vehicle and light truck applications. When to Choose Coarse Grit? Coarse Grit Flex-Hone® for Rotors (60) to blend poorly turned rotors, remove heavy corrosion or for use on flywheels. PLEASE NOTE: These guidelines are intended to offer a starting point in selecting a grit (coarse, medium or fine) for the Flex-Hone for Rotors, but the final selection must be verified by actual trial.